I’ve been using either Verizon, Sprint, or AT&T’s mobile broadband service for over five years. I’m now on my fourth technology iteration and I have a hard time remembering what it was like when Internet was only available at home, office, and the café. I refuse to return to those dark ages! Until recently I used Verizon’s first generation of MiFi hotspot, the Novatel 2200. It’s a great little device that did exactly what I wanted it to. When I needed it to be a WiFi hotspot, it was a hotspot. When I was on the road and needed to charge it via my laptop’s USB port, that worked perfectly as well. Recently however, my company upgraded me to the newest MiFi hotspot, the Novatel 4510L. For the most part the new device is faster, shinier, has better reception… it goes to eleven! The problem is, and I consider this to be a design flaw, is that when you plug the device into a PC, with the USB cable provided, it will only charge the device. The 4510 will neither operate as a WiFi hotspot, nor will it operate as a USB connected modem. I learned this the hard way last week when I spent most of the day at the green mermaid coffee shop waiting for the mechanic to finish my car repairs. As it was a crowded day in laptop land, I only managed to get access to a single power outlet. When the batteries on my MiFi hotspot were nearly tapped, I had to resort to swapping between the laptop charger and the MiFi charger every hour to make it to my car pickup. Armed with a soldering iron and heat shrink tubing, this was an easy hack. A USB cable has four wires; two for power, two for signal. If you cut open the cable and clip the signal wires, then you effectively create a charging cable. Based on a support forum thread at Verizon Wireless (http://bit.ly/pBqf1h), I also learned that you can trick the 4510L into thinking it’s attached to its AC charger if you additionally short the signal wires on the MicroUSB side. So, I closed the circuit on the green & white signal wires on the MicroUSB end of the cable. Important: The signal wires on the host or USB A end of the connection must remain open or you risk shorting out your USB port or damaging your computer. Tie the power wires together, solder & insulate. In order to trick the Novatel 4510L into thinking it’s connected to its AC adapter, short the signal leads on the device or MicroUSB end. Be sure to leave the signal wires on the host end of the cable open. Insulate all of the wires with electrical tape or heat shrink. Finished product. I only made the cable 6″ long so as not to add to the rats nest of cables that I already keep in my backpack. [Update 2011-08-16 10:06 PDT]: According to Verizon Wireless, the shortcoming of not being able to charge and operate the Novatel 4510L while plugged into a PC USB port is a design constraint and not a design flaw. Many PC USB ports fall short of the 500mA power spec and do not provide enough energy to both charge the batteries and power the MiFi radios. My MacBook Pro happens to have enough juice (http://bit.ly/niXKgJ), so I feel it is safe to operate with my hacked cable. 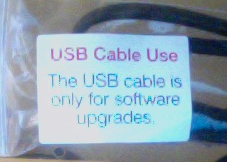 You may want to check the specs on your laptop’s USB ports before you proceed. Ah! Nice job. I just received a 4510L a couple of days ago.